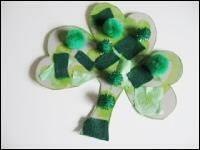 St. Patrick's Day is on the way and here is our lucky craft! I love making collages because they offer wide boundaries. 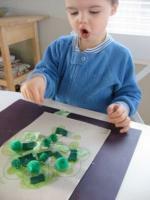 They can be a small easy craft or, for older children, can go on and on with layers of materials and textures. 1. Gather your materials. You will need some cardboard (cereal boxes are the perfect weight), a marker, green paint or crayons, glue, and a variety of green collage material. 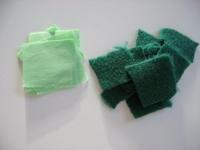 I am using pompoms, tissue paper and felt. 2. 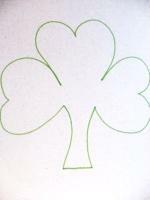 Draw a shamrock on the cereal box. 3. 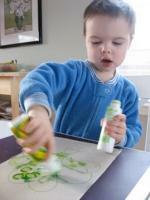 Have children paint or color the shamrock. 4. 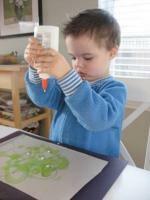 While they are painting take a second to cut the tissue paper and felt into small pieces. 5. 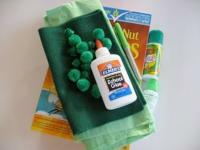 When the shamrock is dry, add the glue. 6. Add your collage materials. There is no wrong way to do this, so have fun! 7. Let dry and cut out.